SAJIDAH WRITES: Morning is Beautiful. 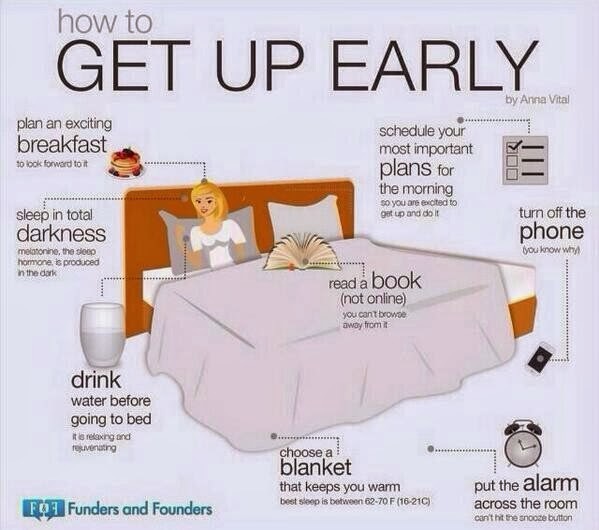 I am practicing almost all of these tips (even before I came across this picture). A book? I have stacks of them on the bed. Such a nice feeling to be accompanied by books. Though I might not be able to read them. Merely as bedmate? Lol. No, really, having books in a distance you can easily reach is very helpful. A page or two is better than none anyway. Sleeping with baby means you really have to sleep in a total darkness. It's important for our health as well, and a good thing to teach our kids to sleep without lights. And finally, I bring my water tumbler to my room and drink before I go to bed. Don't forget green tea too. Awesome healthy drink to be consumed before you close your eyes. Come, let's become a morning person! It's good for our physical and spiritual development. InshaAllah.